I dine out quite a bit. It’s not really healthy and I definitely should cook more and it can be really frustrating because vegan options are so limited. So it was really fresh and new and quite overwhelming when I had a late dinner at Karyn’s Cooked in River North. It’s hard to believe that this is the first time I’ve visited one of Karyn’s restaurants. Karyn Calabrese is a very popular Chicago vegetarian and it was a really big deal when she opened a raw foods restaurant. Her empire has expanded: she has a raw cafe, a raw bistro, an inner beauty center, and her cooked foods restaurant. I’ve heard a lot about her and she seems like an amazingly positive and inspirational person. Karyn’s Cooked is vegan, though they are quick to mention that they use honey in some of their desserts. One look at the menu and I think you will understand why I was overwhelmed. There is so much to choose from, it all sounds really good, and it’s all vegan. There’s no guessing, there’s no having to ask questions about ingredients or request that they hold the cheese. It was really refreshing! I wasn’t super hungry but needed to nosh on something. I decided to go with the vegan pizza, mainly because I’ve been craving deep dish pizza lately. 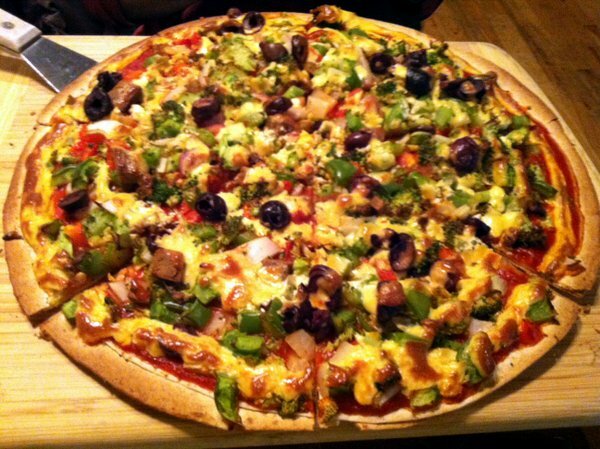 I was amused when the pizza arrived since the description basically said “vegan cheese, seitan, and veggies.” It was topped with a lot of goodies – peppers, broccoli, kalamata olives, and a ton of onions. The cheese and seitan were deceptively good, in my opinion. I would have liked to have a little more cheese on it. The crust was thin and crispy and the sauce was tasty. This is a great deal at $10, especially after I consider how much a frozen vegan pizza costs. It’s under Appetizers so it’s clearly meant for sharing. Two slices and I was stuffed! My friend Chris, a non-vegan, ordered the jerk tofu sandwich. I’ll take his word for it when he says it was good. 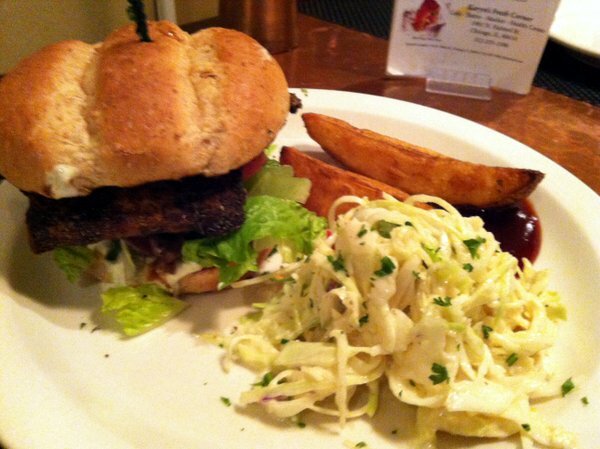 It looked delicious and non-intimidating and was served with potato wedges and cole slaw. The cole slaw looked really good and I couldn’t wait to try it myself. Unfortunately, I was pretty disappointed and so was Chris. My response when I tried it was, “Hmmm… it tastes like… cabbage.” Now, I realize how crazy of a response that is, but it was really the most cabbage-y cole slaw I’ve ever had. Let me take a sec here and thank Chris for taking me to a vegan place. I didn’t even realize how considerate he had been until well after dinner was over. I’m grateful for thoughtful friends! I absolutely want to visit Karyn’s Cooked again. The vibe is really laid back, the space isn’t big but it’s roomy with pleasant contemporary decor, and there were lots of tasty-looking sweets on display. There are so many things on the menu that I want to try: lasagna, enchiladas, meatball sandwich, chili, ribs… and they have beer, wine, and cocktails!